Mathematica Policy Research collected the data for this Issue Brief as part of a project for the U.S. Department of Health and Human Services, Office of the Assistant Secretary for Planning and Evaluation. The study examined the mechanisms that four states are using to improve coordination of behavioral health care, physical health care, housing, and other supports for adult Medicaid beneficiaries with behavioral health disorders. The information in this Brief is based on a review of documents and on telephone and in-person interviews conducted in summer and fall 2014. Information was gathered from state Medicaid and/or behavioral health officials, managed care representatives, behavioral health providers, housing providers, and consumer advocacy organizations. Medicaid beneficiaries with serious mental health and substance use disorders have complex needs that often require an array of health, behavioral health, housing, and other social services. States and communities finance these services through different arrangements, often with little coordination, as separate agencies are often responsible for health, behavioral health, and housing-related supports. Thus, many states are looking for ways to improve care coordination and collaboration among providers. This Issue Brief highlights the efforts of four states--Illinois, Louisiana, Massachusetts, and Tennessee--to facilitate provider-level coordination for Medicaid beneficiaries with behavioral health disorders. It describes the financing strategies and specific mechanisms that states are using to improve care coordination (see Table 1 for a summary of state strategies). It summarizes some of the key ingredients of these efforts as reported by providers, consumers, agency representatives, and managed care companies in the four states. This information may be useful to federal and state policymakers and other stakeholders as they develop their own initiatives. Coordination mechanism and financing. In 2012, the state contracted with a single statewide managed behavioral health organization (MBHO) to manage all behavioral health services for Medicaid and non-Medicaid adults. This new arrangement is one component of a larger effort known as the Louisiana Behavioral Health Partnership (LBHP)--a partnership of several state agencies, including the Office of Behavioral Health and Medicaid, to improve the accessibility and outcomes of behavioral health services. (Physical health services are managed through separate managed care organizations (MCOs) collectively known as the Bayou Health Plans, which are not part of the LBHP).1 The MBHO operates under a 1915(b) waiver for a prepaid inpatient health plan; a 1915(c) Home and Community-Based Services Waiver; and a 1915(i) State Plan Amendment. The MBHO is at-risk for Medicaid adult behavioral health services, and it manages on a non-risk basis behavioral health services for eligible non-Medicaid adults served by the state's public mental health system. To better coordinate care for people with housing needs, the MBHO also recently took over management of a permanent supportive housing (PSH) program. Service coordination on the ground. The MBHO uses its encounter data to monitor consumers' service utilization and identify those in need of more intensive services or follow-up care during care transitions, such as discharge from a hospital. As part of its capitated rate, the MBHO provides some degree of care coordination--including Assertive Community Treatment (ACT) and intensive case management services--to Medicaid adults with serious mental illness (SMI) who qualify for services under the state's 1915(i) State Plan option. Case managers and ACT teams typically coordinate with other community providers to help people access services. The MBHO also offers telephonic care navigator services that help consumers and their families identify and avail themselves of behavioral health resources and providers in the community. The MBHO also encourages behavioral health providers to assess a client's physical health needs. Coordination mechanism and financing. TennCare is a statewide, mandatory managed care program that serves Tennessee's entire Medicaid population under an 1115 demonstration waiver. In 2007, the state began integrating behavioral health services into its managed care contracts; these services had previously been carved out and managed by a separate MBHO. In 2010, the state began including long-term care services and supports in its managed care contracts. Three MCOs currently are responsible for managing physical, behavioral health, and long-term care services using their capitated payment from the state. By integrating the management of physical and behavioral health services, the state hopes to encourage service coordination at both the plan and provider levels. Service coordination on the ground. The MCOs provide case management services primarily by phone at the plan level to individuals with complex health needs, but typically only for a brief duration and to high service utilizers. Among the case management services offered are comprehensive health risk assessments, assistance in making and keeping needed medical and/or behavioral health appointments, and health coaching. In addition, MCOs cover Medicaid mental health case management (MHCM) services provided to TennCare beneficiaries by community mental health center (CMHC) case managers. Finally, TennCare beneficiaries who receive long-term care services are also assigned a care coordinator who assesses patient needs and provides referrals to services and programs. Coordination mechanism and financing. In 2013, Illinois launched the first of six regional Care Coordination Entities (CCEs), which are new partnerships of existing community-based providers that include behavioral health, physical health, housing, and social service agencies. The state Medicaid agency, which oversees the CCEs, auto-enrolled between 1,000 and 1,500 Medicaid beneficiaries with complex health needs in each CCE and pays a per-member per-month (PMPM) coordination fee. The CCEs have the flexibility to use the PMPM fee to cover costs of their choosing, although they primarily use it to cover costs associated with care coordination services. The state hopes this flexibility will encourage the CCEs to find the most cost-effective way to improve care and lower overall costs for this population. Payment for all other Medicaid services is covered separately through the usual fee-for-service arrangements. The state has judged that for individuals with complex medical needs, it is more effective to coordinate care and services in person than by telephone, and it is using this initiative to test these providers' capacity for developing cost-effective models for delivering in-person care coordination. Ultimately, the state hopes the MCOs will find the CCE models appealing, and will contract with them to coordinate care for their members. Service coordination on the ground. The state encouraged CCEs to base their care coordination structure on the health home model, which places the consumer at the center of a team. The diverse range of partners included in each CCE ensures that a variety of services is available, including primary care, specialty and inpatient care, emergency and crisis services, medication management, ACT, psychosocial rehabilitation, detoxification services, and housing and social services. Following a comprehensive needs assessment, the care coordination team develops a care plan and helps to connect the client to the services and resources available through the CCE provider network. The CCE teams are virtual; care team members meet clients out in the community and, when necessary, work out of provider offices. The CCE care coordination team maintains intensive in-person interaction with consumers to connect them with various providers in their communities. Coordination mechanism and financing. In 2006, the Massachusetts Behavioral Health Partnership (MBHP)--the Medicaid-managed behavioral health care carve-out in the state--implemented the Community Support Program for Ending Chronic Homelessness (CSPECH). The program provides Medicaid reimbursement for community-based coordination support to individuals who had been chronically homeless but are now in PSH. CSPECH seeks to achieve Medicaid cost savings by serving this high-cost population in housing rather than on the street or in shelters. CSPECH is currently available throughout the state from eight MBHP providers, which are local partnerships made up of community-based behavioral health and housing providers. CSPECH services are reimbursed by MBHP using a flat per-person per-day case rate. Currently, CSPECH is available only to Medicaid beneficiaries who are enrolled in the MBHP plan (which is open to Medicaid beneficiaries who are not dual-eligible), although the state is encouraging coverage by the other state MCOs. Service coordination on the ground. CSPECH providers employ community support workers (CSWs) to provide outreach and coordination support to individuals in PSH. The intensive in-person support provided by CSWs includes helping clients obtain primary care, driving or accompanying clients to appointments, maintain housing, strengthening clients' independent living skills, and helping clients access social services. The coordination support services provided by CSPECH are reimbursed beginning 90 days before an individual is housed, an arrangement that allows the CSW time to identify a housing opportunity and subsidy resource. The CSW's services are available as long as the individual remains in the housing unit. All other services used by CSPECH clients are reimbursed through the existing arrangements (behavioral health services are reimbursed by MBHP; physical health services are reimbursed through a fee-for-service arrangement with MassHealth). Both Louisiana and Tennessee have implemented statewide managed care arrangements that include mechanisms intended to improve care coordination. But the states have taken different approaches to their managed care arrangements: Tennessee has carved in behavioral health services and encourages competition between MCOs within the same geographic areas, whereas Louisiana has carved out specialty behavioral health services to a single statewide MBH0.2 Both states included specific language regarding care coordination in their managed care contracts and sought to encourage care coordination at the plan level. In the initial years of implementation, these states worked to develop their managed care infrastructure and provider networks; both states are now focusing on strengthening provider-level care coordination. Currently, the initiatives in Illinois and Massachusetts are limited in their geographic scope and rely more heavily on formal partnerships of local provider organizations that deliver intensive in-person targeted care management. In these states, the state agencies have played a relatively limited role, providing an initial investment and the approval of funding, and then relying on local partnerships for implementation. Illinois likened its role to that of a venture capitalist: the state provided CCEs with an initial investment that included a capped number of auto-enrolled clients, claims data, and assistance with contracts and legal arrangements and now provides limited ongoing support while encouraging CCEs to seek their own path towards sustainability. The state hopes that the CCEs will contract with the state MCOs. MassHealth approved funding for CSPECH and is working to encourage other MCOs to cover this service. Specific focus on fostering provider collaboration and care coordination. Although new financing mechanisms and managed care arrangements are intended to facilitate care coordination while taking advantage of existing Medicaid benefits, on-the-ground care coordination and the nurturing of provider collaborations have been essential to connect individuals to services. In other words, new financing mechanisms and managed care arrangements alone may not directly improve care coordination without engaging providers in such activities and without an entity, such as a care management organization, to connect people to services. "Now, every agency is trying to get a client connected with a primary care provider if the client has physical health needs. There's definitely more emphasis on that now. The directive comes from state leadership to TennCare, from TennCare to MCOs, and from MCOs to providers." Providers and consumer organizations noted that clear directives from state agencies along with contract coordination requirements and guidance from MCOs were critical for enhancing coordination. Providers in all four states noted an increased emphasis on care coordination at the state level, although this emphasis looks slightly different depending on the state. For example, behavioral health providers Tennessee noted that the MCOs are paying more attention to coordination through specific language included in provider contracts, which encourage behavioral health provider to collaborate with physical health providers. In Massachusetts and Illinois the state has encouraged care coordination through the development of new funding streams for specific services. In addition, stakeholders in every state reported the need for stronger collaborations with substance abuse use disorder and criminal justice systems but noted some efforts to improve coordination with these systems at the provider-level. "Before [receiving services from a CCE] I felt alone. Nobody would respond to me. For 12 years I had to navigate the Medicaid system on my own and it was terrible. Now I have my coordinator's attention whenever I need it. I have his cell number. He came to my home and got to know me. I know he's on my side." Medicaid coverage of case management. State officials, managed care representatives, and providers alike in all four states stressed almost universally the importance of reimbursement for case management or care coordination services. In most states, providers deem the services so critical that they often provide some type of in-person coordination without reimbursement when individuals lose eligibility for such services. Some consumer groups also mentioned playing the role of case managers for individuals who do not have access to care management services. "If you want to do a true integrated approach, you cannot do it without true in-person case management. It can't be telephonic; this population is too sick, needy, and often paranoid. There needs to be a case manager over both physical health and behavioral health." In each of the four states, providers and consumers mentioned that care managers or coordinators facilitate greater coordination of care by building relationships with primary care and other providers. Providers mentioned that case managers coordinate a broad range of health and social services for beneficiaries and often facilitate beneficiaries' health care by helping clients navigate provider networks, establishing connections with social service systems, and helping clients be engaged in their health care. In Illinois and Massachusetts, consumers regarded their care coordinators as personal advocates, and other providers acknowledged coordinators for providing them with contextual information about patients that could influence treatment choices or adherence. State leaders, providers, or consumer representatives in at least three states also noted that for this often transient and difficult-to-engage population, in-person care management of some variety is superior to telephonic care management. Alignment of service criteria and contract language with care coordination models. Providers in several states mentioned that evidence-based practices or approaches to team-based care coordination sometimes do not align with standard billing codes or managed care approaches to reimbursement. Several providers in Tennessee, for example, mentioned their ongoing negotiations with MCOs around reimbursement for case management; some providers prefer daily or case rates, such as those used in the Massachusetts and Illinois initiatives, which they perceive as offering more flexibility for case management services, rather than fee-for-service reimbursement. Existing service definitions and reimbursement strategies may therefore need to be evaluated to ensure they align with specific coordination goals. Providers also noted challenges related to contracts. For example, in Illinois, some of the community-based organizations leading CCEs did not have sufficient experience or capacity to handle start-up administrative tasks such as crafting contracts and other legal documents. As a consequence, the state has had to provide more upfront support than originally anticipated. In other states with managed care arrangements, providers also expressed challenges navigating contractual issues with MCOs or MBHOs. In Tennessee, some providers suggested that contract negotiation specialists could help them establish contracts with multiple MCOs. Providers in several states also identified tension between managed care medical necessity criteria that individuals must meet in order to qualify for services and the need among many consumers for ongoing supports to maintain their mental health. For example, continued access to services such as ACT may allow recipients to function above the level of medical necessity, yet without the services, their conditions would deteriorate. One provider, for instance, expressed frustration around service reauthorizations and noted that when clients lose access to services that are maintaining stabilization, they must "fail in order to succeed again." Smooth Medicaid billing processes and provider support. Providers and state officials noted the importance of thoughtfully engineered and executed billing processes and policies. Providers suggested that billing policies, such as same-day billing for physical and behavioral health services, can help foster efforts to coordinate care. For example, states that allow same-day billing (which is permitted under federal regulations) may offer the flexibility in reimbursement necessary for physical and behavioral health providers to co-locate services. In addition, billing delays and system kinks have very real implications for mental health providers, who often operate without much financial cushion and have difficulty absorbing payment delays. Providers in Louisiana, for example, expressed deep frustration about challenges associated with the roll-out of a new billing system, and about revenue cuts associated with the LBHP; some providers reported that these challenges led some private providers to close, lay off staff, or stop accepting Medicaid patients. Providers suggested that billing systems must be fully operational before being introduced in order to prevent disruptions in care. In Tennessee, some providers reported struggling to align internal billing policies to accommodate the different billing processes and reimbursement approaches of multiple MCOs for services like case management; this was a particular challenge for CMHCs with little experience billing private insurers. As a result, some providers recommended hiring specialized administrative staff to help with billing. In both Louisiana and Tennessee, state agencies and managed care companies recognized a critical need to educate and support providers as a way to ease transitions. In all states, providers and policymakers alike suggested that the success of coordination efforts hinges on the ability of providers to adapt to and thrive within new financing arrangements and models. Several state efforts build upon existing structures and policies in order to prevent disruptions in care and capitalize on existing provider relationships. For instance, CSPECH services in Massachusetts are billed under a pre-existing service category (community support program services). Massachusetts providers identified ease of billing--facilitated by minimal changes to billing systems and processes--as a particular advantage for provider partnerships in the state. "The ER data comes in [from MCOs] every day. It's based on claims; it's real time. It started recently, and it's eye opening. We can look at the CPT [current procedural terminology] codes they presented with and start looking at the reasons that people are going and where they're going. We can see that patients are sometimes going to 3-4 different ERs in the same day, so that obviously gives us insight on what we need to do on the behavioral health side." Data sharing as a way to enhance coordination. Respondents in all of the states acknowledged that more and better data sharing would enhance collaboration among providers. Providers that had access to information on their clients' use of primary and emergency care reported that they were better able to ensure appropriate use of care and to target outreach efforts to clients' other providers. In Tennessee, the MCOs are urged to integrate their internal data systems so that MCO staff can access both physical and behavioral health information. Providers, in turn, can and do request data from MCOs to facilitate care coordination, such as alerts on clients' emergency department use. Similarly, the MBHO in Louisiana has begun to receive primary care usage data from the physical health plans. In contrast, the CCEs in Illinois and the CSPECH providers in Massachusetts rely on the limited Medicaid claims data they receive from their states; providers suggested that any improvement in data use and sharing will need to stem from the local partnerships. The CCEs in Illinois, for example, receive Medicaid claims data from the state but must develop their own mechanisms for tracking service use associated with their non-Medicaid partners. The CSPECH providers in Massachusetts, which are part of the state behavioral health organization's network, receive claims data only for behavioral health services (unless they obtain a release authorization from the client). Local partners acknowledge that investing in data-sharing mechanisms would address these gaps, but they lack the necessary resources to pursue development. In the states in which data-sharing capabilities were not readily available, providers indicated a desire for such opportunities. "[Responsibility for care at the local level] has been very positive for the community…through our board we can bring in services and supports that meet the needs on a community-basis, rather than having people who aren't on the ground and don't know what our reality is take a cookie cutter approach for the whole state." Leveraging local understanding. Providers and state representatives in all states recognized the value of local knowledge in fostering collaboration. Local community-based organizations, which understand the needs of the local client base and are knowledgeable about local resources, were identified as best situated to find and engage hard-to-reach clients and provider networks--particularly in Illinois and Massachusetts, where local partnerships and providers are central to the states' coordination efforts. Tennessee and (to a degree) Louisiana rely on local community mental health providers and case managers to ensure coordinated care for the clients they serve; these local entities tend to have a thorough understanding of, and relationships with, other local providers and social service organizations. The experience of the four states suggests that programs must be flexible at the local level to address community-specific needs and account for the local provider landscape. As the programs described here demonstrate, Medicaid offers states the flexibility to develop initiatives that have the potential to improve the coordination of care for people with behavioral health disorders and meet these individuals' unique needs. Although the four states developed their initiatives under different financing authorities and using different reimbursement mechanisms and partnership structures, state agencies, managed care representatives, and providers alike identified common ingredients necessary to improve collaboration among providers and coordination for beneficiaries. The ingredients and approaches described here could be useful for other states and communities seeking to improve provider collaboration and care coordination for the Medicaid beneficiaries they serve. Louisiana Behavioral Health Partnership (LBHP); began March 1, 2012. TennCare; began integrating behavioral health services in 2007 (these services fully integrated by 2009). Care Coordination Innovations Project, which funds CCEs; began September 2013. Community Support Program for Ending Chronic Homelessness (CSPECH); began 2006. A single statewide MBHO is at-risk for specialty behavioral health services for Medicaid adults and manages care (non-risk) for non-Medicaid adults. TennCare is Tennessee's Medicaid program. All Medicaid managed care contracts integrate physical, behavioral, and long-term care services. The state's Medicaid agency oversees 6 regional CCEs. CCEs are a formal hub of community-based providers representing behavioral health, physical health, and housing and social service agencies. CSPECH is a Medicaid-reimbursable service that provides total care coordination support to chronically homeless individuals who have been placed in PSH. State makes prepaid capitated payments for behavioral health services for Medicaid adults, and fixed payments for non-Medicaid adults. It is authorized through a 1915(b) waiver, a 1915(c) waiver, and a 1915(i) State Plan Amendment for adults with SMI. TennCare makes capitated payments for Medicaid beneficiaries. It operates under an 1115 waiver. CCEs receive a PMPM coordination fee, supported through a 3-year state contract. CSPECH is a type of community support program service for which the state receives Centers for Medicare and Medicaid Services approval for reimbursement through its managed care waiver. All state MCOs are approved to provide this level of care; currently only MBHP covers this service. Coordination requirements are embedded in the managed care contract. Management of physical and behavioral health care services occurs under the same MCO contract. CCEs formalize a partnership between local behavioral health, physical health, and other providers. Care coordination teams work for the CCE, thus operating across sectors. CSPECH services are provided by CSWs who coordinate behavioral and physical health services. Louisiana is beginning to define care coordination at the plan and provider levels. The MBHO and health plans recently began exchanging patient-level data. Adults who qualify for 1915(i) may receive case management through intensive Medicaid services (e.g., ACT), and all consumers can call Magellan for provider referrals. In addition to integration of behavioral and physical health management at the state and MCO levels, Medicaid beneficiaries eligible for MHCM receive help coordinating their physical health services. MCO case managers also are available to high service utilizers to assist with care coordination. All clients are assigned to a CCE care coordinator who is a mental health or community health professional. Coordinators inform providers about their clients' needs and events. CSPECH services are available through community-based behavioral health providers. CSWs work with their clients to establish a primary care physician and accompany clients to appointments and follow up regarding treatment adherence. In late 2014, Louisiana announced plans to carve the management of specialized behavioral health services into the Bayou Health Plans, thus terminating the MBHO carve-out. As of February 2015, the state was considering options to continue to manage services for non-Medicaid adults and children. As mentioned above, the state plans to follow a path similar to Tennessee's by integrating specialty behavioral health with physical health services in managed care plans in 2015. This Issue Brief, authored by Allison Wishon Siegwarth, Matthew Kehn, Jonathan Brown, and Rebecca Kleinman, highlights the efforts of four states--Illinois, Louisiana, Massachusetts, and Tennessee--to facilitate provider-level coordination for Medicaid beneficiaries with behavioral health disorders. This Brief was prepared under contract #HHSP23337004T between the U.S. Department of Health and Human Services, Office of the Assistant Secretary for Planning and Evaluation, Office of Disability, Aging and Long-Term Care Policy and Mathematica Policy Research. 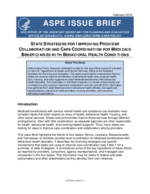 For additional information about this subject, visit the DALTCP home page at http://aspe.hhs.gov/office-disability-aging-and-long-term-care-policy-daltcp or contact the ASPE Project Officer, Kristina West, at HHS/ASPE/DALTCP, Room 424E, H.H. Humphrey Building, 200 Independence Avenue, S.W., Washington, D.C. 20201, Kristina.West@hhs.gov.